Thank you much for the guidelines. thanks for the tip, typo is now fixed. 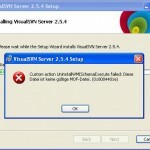 Stopping Win installer service required me to stop IP Helper server. So after step #7 I’ve restarted the IP Helper service manually. There is easier solution, actually. 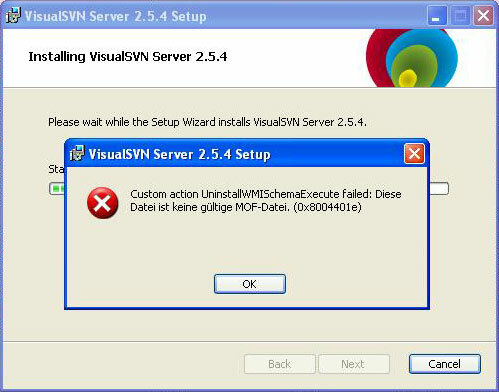 The error is caused by the fact the file “%VISUALSVN_SERVER%WMIVisualSVNServer.mof.uninstall” is missing. Do you have any assumptions why it got removed then? You can manually create the “%VISUALSVN_SERVER%WMIVisualSVNServer.mof.uninstall” file. Leave the file empty and the upgrade / uninstall of VisualSVN Server will succeed.